Don't wake a sleeping Dragon. I am a double blue eye blue merle mini aussie with a tail. I have won best of breed MINI AUSSIE puppy class 9/2018. I was the biggest of my litter. 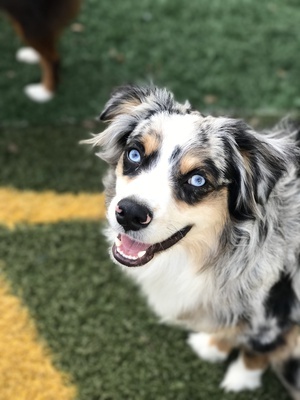 My mom is a double blue eye red merle mini aussie. My dad is a dark eye black tri mini aussie with show lines.